One of the best ways to permanently replace missing teeth is with dental implants. Dr. Boisson has more than 22 years experience placing and restoring implants. That means that he guides your care through the whole process with no referral out to specialists. For patients who are more anxious or who need multiple procedures, we also offer sleep dentistry to keep you relaxed. Implant restoration involves placing tiny titanium steel posts into the jaw bone to replace the missing tooth’s root. 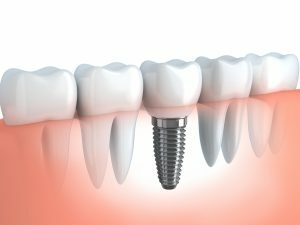 Unlike dentures or bridges, an implant is completely independent. Once the tissues have healed around the post, it is held in place. Once your tissues have healed and your bone has been given the chance to grow around the implant, we can then begin the process of fabricating your crown. To create your new artificial tooth, a scan is taken of your teeth with our iTero machine to avoid the uncomfortable goopy impressions. We send this scan to a lab where they make your implant crown to match your natural teeth. Two weeks later we have you return to the office for placement of your crown. Who are the best candidates for implants? The best candidates for dental implants are people with sufficient amounts of jaw bone tissue. This is important because enough tissue is needed to support the implant. During your evaluation, we will thoroughly examine your mouth and go over your health history to ensure you’re a proper candidate. Tiny metal implants are embedded into your jaw bone. Small posts are attached to each implant which provide anchors for the artificial tooth. Most patients will only require one surgical procedure. During your procedure, you will be given an anesthesia to ensure you will remain completely comfortable. For patients who are more anxious or who need multiple procedures, we also offer sleep dentistry to keep you relaxed. Following your surgery, it will take 3 to 6 months for your tissues to heal around the implant. During this healing phase, the tissues will bond with the implant, holding it firmly in place. Once your tissues have healed, the second phase begins. To create your new artificial teeth, impressions are taken. Posts or attachments are attached to the implants and the artificial teeth are custom made over them. This phase will last approximately 3 to 6 months. To find out if dental implants are right for you, contact us at Boisson Dental Group in Grande Prairie at 587 771 7668 or info@boissondental.ca to set up an appointment.